There was plenty of exciting action in Week 6, but no teams dominated as much as the Cowboys and Ravens. Both Dallas and Baltimore outplayed their respective opponents to win by a combined score of 61-7. 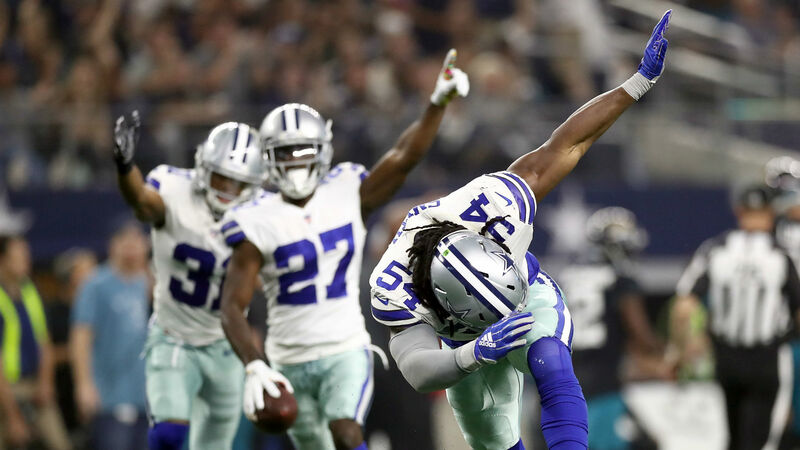 The Cowboys, who reached .500 with the win, used the arm of quarterback Dak Prescott and eight different receivers to spread out the struggling Jaguars’ defense. Dallas shut out Jacksonville in the first half and followed with scores on four of its last five possessions to pull away. Prescott finished with one of his best performances of the season, completing 63 percent of his passes for 183 yards and two touchdowns. Meanwhile, the Ravens earned their first shutout victory of the season with a 21-0 win in Tennessee. Baltimore slowly and steadily built up its lead, scoring a touchdown in each quarter while holding the Titans to just 106 total yards. Tennessee couldn’t get anything going, recording just seven first downs, and the Ravens took advantage. They tested a tired defense and had a 361-yard day. The Rams held off a Broncos comeback and left the Mile High city with a 23-20 victory to remain undefeated. The Steelers also came away with a win thanks to a late touchdown reception from wide receiver Antonio Brown. An overtime blunder took place in Miami, and it was the home team that pulled out the victory. After fumbling on the goal line, the Dolphins survived a missed Bears field goal and followed with a game-winning 47-yard make of their own. Raiders wide receiver Amari Cooper suffered a concussion after a hit by Seahawks safety Bradley McDougald. Oakland quarterback Derek Carr also battled a shoulder injury in the game, but reports say it is not serious and he shouldn’t miss a game with the team on a bye next week. Bills play caller Josh Allen suffered an elbow injury in the third quarter and did not return. Allen was replaced by Nathan Peterman, who threw an interception that was returned by the Texans for the game-winning score. Rams wide receiver Cooper Kupp was carted off the field after sustaining a knee injury during a horse-collar tackle in the first half. Los Angeles’ top target looked to have bent his knee in the opposite direction during the play. But he returned to the field after halftime. Mike Evans became the Buccaneers’ all-time leading receiver in yardage, surpassing Mark Carrier, who held the previous record with 5,018 yards. The fifth-year receiver finished the game with 58 yards on four catches. Vikings wide receiver Adam Thielen, who set a record last week by opening the season with five games of 100-plus yards, racked up another 123 yards against the Cardinals, pushing the streak to six games. Steelers wide receiver JuJu Smith-Schuster doesn’t get the touchdown here, but it’s still an incredible catch. Chargers veteran quarterback Philip Rivers throws into triple coverage to hit wide receiver Tyrell Williams from 45 yards out. This looks like the J.J. Watt who won three NFL Defensive Player of the Year awards. The Texans defensive end finished with three total tackles. Vikings running back Latavius Murray with a nice burst — and even better stiff arm — for the touchdown. Jets cornerback Morris Claiborne is in the right place at the right time to pluck this easy pick-six out of the air. PICK-6 to start the day! A diving touchdown from Cowboys wideout Cole Beasley helped put the hosting Dallas squad up two scores in the first half. [email protected] dives in for the #DallasCowboys TD! Broncos wide receiver Demaryius Thomas had a nice toe-drag for a touchdown that helped keep Denver in the game against a tough Los Angeles team.